Kokstad Medical Centre is a private secondary level healthcare facility located in the busy trading town of Kokstad in the south of Kwazulu Natal. Located 140km from the nearest city, Kokstad Medical Centre (KMC) provides holistic evidence based medicine to a vast and diverse clientele that travel from as far as Umtata, Lusikisiki, Matatiele, Bizana and Lesotho. Our team of five doctors are all passionate about medicine and with over 100 years of combined clinical experience, we are able to offer our patients a comprehensive medical and surgical service. Our practice is fully electronic with all patient records, x-rays, scripting, billing, bookings and communication being delivered by high resolution computers. Our entire facility is networked and Wifi enabled, enabling doctors' ward rounds to performed on laptop computers where patient information is readily accessible. All pathology results, specialist referrals and managed care documents are integrated into our patients' electronic profiles optimising their longitudinal continuity of care. In short, our digital transformation has revolutionised the way we practice medicine. We are efficient and effective and our systems keep our patients updated continually via SMS's and emails. We have a 40 bed private hospital adjoining the medical centre where we care for our inpatients and perform a range of surgical procedures in our two fully equipped theatres. 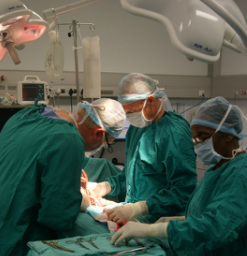 These include general, orthopaedic, obstetric, gynaecological, ENT, and urological surgeries. When time is critical, travelling an hour and a half may delay essential medical or surgical care. Kokstad Private Hospital also offers a 24-hour emergency unit that is covered both day and night by the medical officers of KMC. The learning environment within KMC both surgically and clinically is outstanding. Clinical education is a priority and we are eager to continually broaden and improve on our clinical offering. At KMC, our vision is to champion world class holistic medical care to a largely rural population that has historically been unable to access this level of care. We are continually striving to improve our healthcare offering by optimizing both what we can do and how efficiently we can do it.